Have you heard of the rom-com, “Man Up,” starring Simon Pegg and Lake Bell? I’m still heartbroken about Robin Williams’ death. I still can’t believe that we’ve lost such a rare comic talent and, by all accounts, such a wonderful human being, to boot. I feel like his movies and TV have defined so many stages of my life – “Mork and Mindy” as a child, “Dead Poets Society,” “Awakenings,” “The Fisher King” and “Aladdin” in high school, “Good Will Hunting” in grad school when I was also living in Boston, “Happy Feet” now with my own kids. And we still have more to go. Our family still hasn’t seen any of the “Night at the Museum” films, “Jumanji” or “Popeye.” His passing has also served as a reminder to me of his really wonderful body of work that he has left behind and that we need to seize the day. On that note, Secret Cinema (see my previous blog post about Secret Cinema) in London is hosting a film screening in tribute to Robin Williams this Friday at the Troxy in East London. 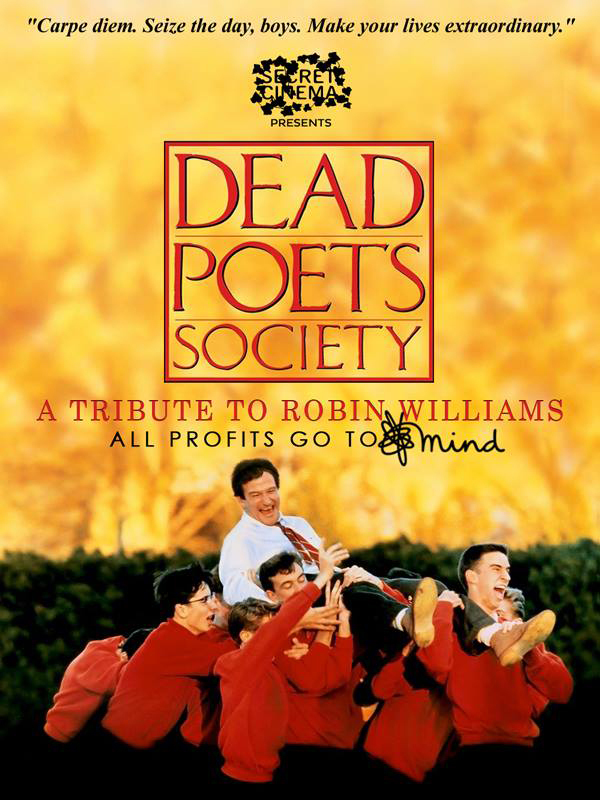 They will be showing “Dead Poets Society,” which will raise money for the mental health charity Mind. The evening will feature live music, food, poetry and other performances, in addition to the film. For more information or to purchase tickets, visit robinwilliams.secretcinema.org. This weekend, we watched “Begin Again” with Keira Knightley and Mark Ruffalo. I hadn’t heard much of anything about the movie, apart from the fact that it was written and directed by John Carney behind “Once,” but fancied getting lost in a movie in the big screen for a couple of hours and am so glad we went. It was lovely, with a great cast of British (Keira Knightley, James Corden) and American actors (Catherine Keener, Adam Levine), set in New York City. I dare say I enjoyed it more than “Once” and again, John Carney makes a convincing argument that a song can save your life. The soundtrack is playing on repeat at home. This new Judi Dench and Steve Coogan movie looks stellar! Its release date is scheduled for Nov. 1 in the U.K. No details yet of the U.S. release. Thanks to Lillie for sending me this! This weekend, I watched a British film called “Submarine” by writer/director Richard Ayoade. Have you heard of it? I love watching holiday films (“Love Actually,” “National Lampoon’s Christmas Vacation,” “Home Alone,” etc.) in the ramp up to Christmas. Friday night we watched “The Holiday.” Have you seen it? I’m always comforted by a Nancy Meyers movie, not only for the rom-com storyline but the lush interiors, gorgeous wardrobes, Hans Zimmer soundtrack and fabulous locations (hello, charming hobbit house in Surrey!). Endless eye candy. But I particularly love “The Holiday” for the side-by-side comparison at English and California life. If you haven’t seen it yet, check it out! I first saw Withnail and I my third year of uni (translation: university), while studying abroad in Stirling, Scotland. Released in 1987 about two struggling actors in London in 1969, Withnail and I is one of those movies that never made it big in the US, despite its brilliance. It remains one of my favorite British films and I share it today simply to urge you to see it, if you haven’t yet. It’s available on instant queue on Netflix. And while we’re on the topic of lesser-known British movies, do you have any good ones to recommend?